We already mentioned that the two screens have different aspect ratios, but we didn't cover what difference that makes. The 16:9 aspect ratio of the Samsung Galaxy S III is more media oriented, while watching videos on the Optimus G will entail either letterboxing or cropping. LG chose to focus on text instead - the 15:9 screen is taller in landscape orientation, which is more accommodating to reading web pages, emails, documents and so on. But there's an even more fundamental difference between the two screens - one is an LCD, while the other is an AMOLED. The LG Optimus G has a True HD-IPS+ LCD screen with 768 x 1280 resolution. 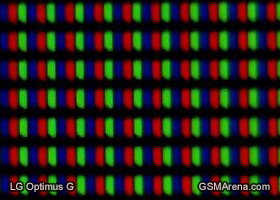 On a 4.7" diagonal, that means 318ppi pixel density, but the bigger advantage here is the full RGB matrix. The Samsung Galaxy S III uses a Super AMOLED screen with 720p resolution, which combined with the slightly bigger diagonal makes for a slightly lower pixel density of 306ppi. It's a PenTile matrix though, so pixel densities shouldn't be compared directly. We used a digital microscope to shoot the matrices of both screens up close. 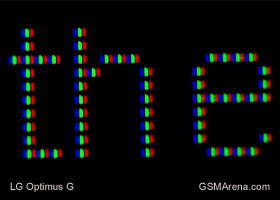 On the Optimus G, each RGB triplet is a pixel, while on the Galaxy S III pixels are composed of either an RG or a BG pair. The macro shot of tiny white text is very telling when it comes to sharpness - the Galaxy S III has to use sub-pixel rendering, so the 1px-wide lines on the font come out 1.5px thick (it needs two pixels to get all three primary colors). For normal-size text, the effect isn't very visible, though if you look up close you'll see a telling cross-hatch pattern. Text on the Optimus G remains sharp even on very low zoom levels. 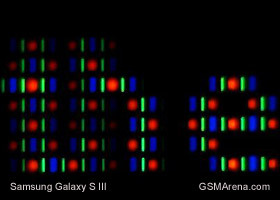 The Super AMOLED screen may lose in sharpness, but it has some inherent advantages. The black levels are virtually 0, the contrast is superior and the colors are more saturated (though this might not appeal to everyone). The LCD has a few tricks up its sleeves as well. For one, it's brighter (it scored 141 nits more than the Super AMOLED) and for another it's got a slightly more realistic colors. Sure, there is light leaking through black colors and it's noticeable even in a well-lit room, but with the extra brightness, the contrast ratio still works out to an impressive 1438:1. An issue of the IPS+ technology are the viewing angles - the LG smartphone exhibits both contrast degradation and color shift when you view it at an angle. The color shift is most visible when it's rotated (i.e. having one of the four edges pointing at you), which isn't the case most of the time, so it's not a major issue. The Super AMOLED screen shows a faint greenish tint at an angle, typical behavior for AMOLED screens, but it's no as bad to look at. What is a major issue, however, is screen reflectivity. LG has been touting their ZeroGap technology that is supposed to minimize reflections, but it doesn't work quite as advertised. The Optimus G screen is way too reflective, giving it below average sunlight legibility. 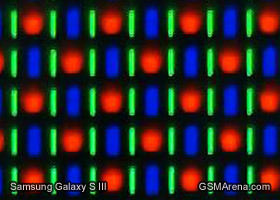 The Super AMOLED screen on the Galaxy S III, on the other hand, is one of the best we have tested in this regard. To summarize our findings, the Samsung Galaxy S III screen loses on sharpness and maximum brightness (some people find it too dim), but it has great saturation, contrast, angles and sunlight legibility. The LG Optimus G screen is still among the best though - it offers great sharpness, higher brightness and very good colors (though not perfect). Disappointing sunlight legibility is quite an issue however. We separate battery life into three important categories - talking on a 3G network, browsing the web over Wi-Fi and watching videos. Then we take those numbers, plus a standby reading and give each phone an endurance rating - how long last without needing a charge, if you do an hour of each activity per day. It's important to note that both phones have 2100mAh batteries, but the LG Optimus G uses a next-gen chipset, while the Samsung Galaxy S III has the best of the outgoing generation of Exynos 4 chipsets. Calling is generally a test of how efficient the modem of each phone is - the screen is off and the CPU has nothing to do. 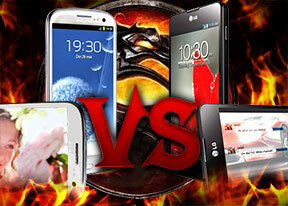 The LG Optimus G scores a major victory here, beating the Galaxy S III by 50%. While it's not the best score we have seen, the S4 Pro is certainly off to a good start. Surprisingly the Samsung Galaxy S III did a job at the web browsing part of the test, outlasting the Optimus G by about an hour and fifteen minutes. It did get a big boost from the Jelly Bean update (curiously, the boost is about an hour and fifteen minutes), so we suspect the LG phone might catch up when it gets the Android 4.1 update. 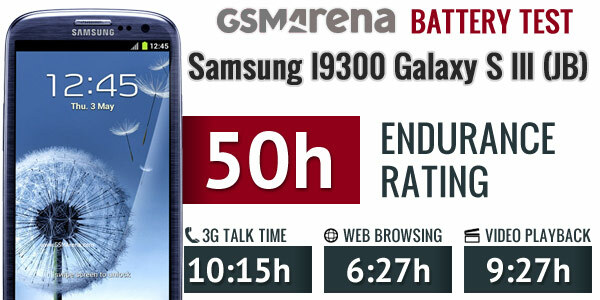 The Samsung Galaxy S III rounds up the score in its favor with a two hour advantage in the video watching test. The Optimus G is three hours ahead of its Optimus 4X predecessor, so it's a good score too, just not good enough for the win here. 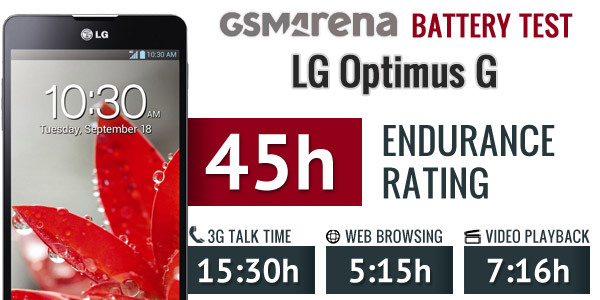 In the end, the LG Optimus G scores an endurance rating of 45 hours, while the Samsung Galaxy S III earned a score of 50 hours. You can read about more our testing methodology here. Talkative people will get better battery life out of the Optimus G, but for tasks that require the screen to be on and the CPUs working, the Galaxy S III will generally last longer. We have to say that the Galaxy S III was performing virtually identical to the Optimus G before the Jelly Bean update, so we suspect the two will be on par when the LG flagship get treated to the latest Android version.